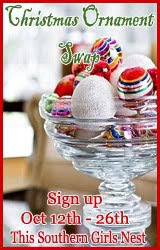 Today is the last day to sign up for the ornament swap at This Southern Girl's Nest. I am completely embarrassed to call this a menu plan this week, as there will be very little cooking going on around here next week. We are going to be traveling on Monday and will be eating on the road. Then on Tuesday our local Papa Johns will be hosting a fundraiser for the kids school so we will be eating pizza on Tuesday, and then on Friday afternoon we will be heading out in our camper for the weekend. The campground we are heading to has all kinds of cool activities planned for the kids for Halloween weekend, and then on Saturday they will get to trick or treat around the campground. So with all of this going on I will really only be cooking at home two nights this week. That's right, two nights! Now you see why I am embarased to call this a menu? I hate to say it but time has really gotten away from me this year. I haven't felt well the last few weeks, I have had a horrible sinus infection, and I haven't really felt like sewing. Believe it or not I am just now getting around to starting the kids Halloween costumes. 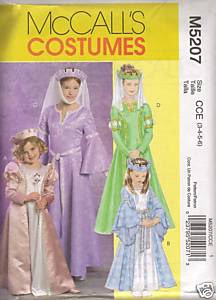 Back around Labor Day, yes that's how long I have been procrastinating, I bought this McCall's Pattern for the girl's Halloween costumes. At first both girls wanted to be the pretty Renaissance princess but then, as usual, Sunshine changed her mind. She wanted to be a witch. Well, I had about nine yards of this shiny black fabric that I had purchased a while back that was just sitting in my sewing room, so I thought that would be perfect for a witch dress, and since I already had the pattern I thought why not use it to make a fancy witch dress. 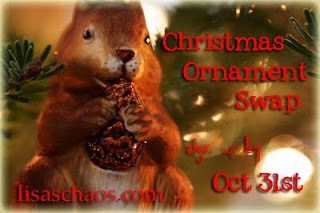 Don't forget about the Christmas Ornament Swap that is going on at Lisa's Chaos. If you want to participate you need to sign up by October 31st! After reading a blog post about Show and Tell Fridays on the blog A Little of This and That I decided to participate in Show and Tell Fridays myself. 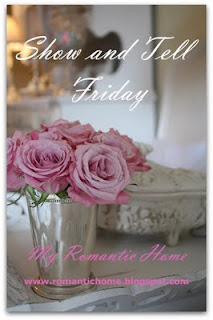 Show and Tell Fridays is hosted by My Romantic Home, which is a very lovely blog. I love the photos of her home, and makes me wish that with my young children I could keep my home that lovely. The week before this past Mother's Day I went with my daughter's to a local tea room. My girls absolutely loved it, especially Sunshine, who is the girliest girl I know. After our visit she was very insistent that she wanted a tea set for her birthday in August. I looked everywhere for the perfect tea set, I really wanted to find her the perfect, girly tea set, and I wanted it to be an antique. 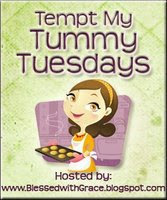 I have been wondering for the past couple of days what I am going to blog about today for Crockpot Wednesday. I love my crockpot but I use so many of the same crockpot recipes over and over again when cooking in it. I have been using Stephanie O'Dea's blog A Year of Slow Cooking as a source for inspiration, she has some wonderful crockpot recipes on her site. I am actually cooking her Peking Pork Chops in my crockpot as we speak (well you know what I mean). And the sauce smells so good. I think most of the smell comes from the 5 Spice Powder, which can be hard to find, I had to visit a Chinese Food Store to get mine. I also added some chopped onions to the mixture just for fun. Since there are six of us, I had to add more pork chops, so I doubled the sauce recipe. I am also using boneless chops instead of the ones with the bones, they were the ones that were on sale last week. I told you that I'm not good at following directions! Yes, another giveaway! My daughter is totally in love with the Madame Alexander dolls, and like Tori Spelling I believe they are to be played with. If you know of a little girl who would also love a Madame Alexander doll you should visit Frugal & Fabulous to register for a chance to win a Madame Alexander doll from Avon. If dolls aren't your thing, that's okay, Frugal & Fabulous is also giving away a basket full of Avon products. Have you heard about this new book from Zondervan Publishing yet? 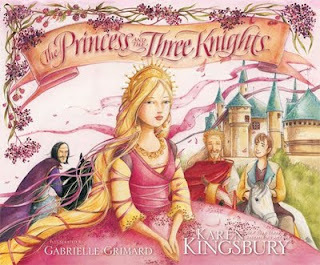 It is written by New York Times Best Selling Author Karen Kingsley and is one that I have been dying to get for my daughters. Right now Lisa at Blessed With Grace is giving away a hardcover copy. Be sure to visit her blog to find out how you can win! You may not have been able to tell it by meal plans but I have been on a diet here lately. I usually fix a meat for supper that I can enjoy, and I eat a salad while my family enjoys their potatoes, homemade bread, and other carb filled goodies. My tummy has really been tempted lately, believe me. 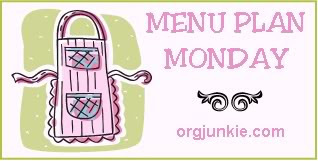 Yesterday, while viewing other Menu Plan Monday posts, I ran across The Sister's Cafe blog. It is an awesome blog full of yummy, yummy recipes. I have so many that I want to try, and found one that I just couldn't pass up. It was their Peanut Butter Bars with Fudge Icing. My dieting, depraved tummy wanted some of these, and I knew my family would love these. The one thing that struck me as odd when reading the recipe was the oatmeal that goes in them. I had never pictured oatmeal as an ingredient in peanut butter bars, so I was skeptical. However, I was suprised to learn the oatmeal gives them a delicious texture, and in my opinion is what makes them soooo great. Outside my window....the sun is shining brightly. I am thinking...about how much I need to get done but haven't gotten around to doing. I am thankful for....the huge weight that has been lifted off of my shoulders by the events of last week and the opportunity for the weeks events to make a huge impact on my family's future. From the kitchen....I just finished making homemade hoagie rolls for tonight's Meatball Hoagies. I am creating....the girls Halloween costumes. It's down to crunch time and I need to get them finished this week. I am going....to run a few errands before picking the kids up from school this afternoon. I am hearing....nothing. Silence really is golden. Around the house....I have a lot of laundry that needs to be done. A few plans for the week....nothing. Isn't it wonderful? 1. Brown hamburger in a skillet. Drain off the grease and remove the meat from the skillet. 2. In the remaining grease in the skillet, cook the onion and garlic until translucent. 3. Place the cooked hamburger, garlic and onions in a stock pot. Add in remaining ingredients. 4. Bring to a boil. Reduce heat, and let soup simmer until macaroni is done. Remove Bay Leaf before serving. This past week was a very busy week for us. The kids were out of school on Thursday and Friday for fall break, and we had a family birthday dinner here on Saturday for our two oldest kids. As I promised last week I posted pictures of their cakes, and our menu from the dinner (along with the recipes). We didn't do anything too fancy, my husband has a new grill which he just had to use so he could show it off. Men really are just overgrown kids, aren't they? Last Wednesday our local Papa Johns ran a special on large pizzas, which was a fundraiser for the kids school. So we ended up enjoying Papa John's pizza instead of our scheduled Meatball Hoagies, which have been bumped to this week's menu. This post has been updated with photos here. This is one of our favorite foods cooked on the grill. It's always a crowd pleaser when we serve it at gatherings. Wrap a wedge of cabbage with a slice of bacon and place on a piece of aluminum foil. Place 1 teaspoon of butter on top of cabbage wedge, and finish wrapping with foil. Cook on grill for about 45 minutes. Yesterday we had a family birthday dinner for our two oldest children. Our oldest son, Skateboarder, will be turning 16 on Tuesday and our oldest daughter, Bubbles, turned 12 last Saturday. On top of that yesterday was also my mother-in-laws birthday, and I will politely not mention her age. So on Friday I made three birthday cakes. I love cake. It makes me very, very happy. And you know when momma's happy, everybody's happy. I also love my crockpot. Actually I am addicted to my crockpot My family teases me quite a bit about it. I probably need to join a twelve step program to help me deal with my crockpot addiction, but that's a whole other post. So when I found a recipe that combines my two greatest loves (cake and crockpots) you know I just couldn't pass it up. This Hot Fudge Cake recipe on Disney Foods is unbelievable. Go ahead, give it a try. You know you want to! 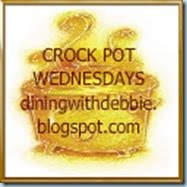 And head on over to Dining With Debbie for more Crockpot Wednesday posts! I am so irritated with Blogger. When I type out my Menu Plan Monday post I format it and space it just like I want it but then as soon as I hit Preview or Publish it all gets squished up. Any ideas on what I am doing wrong or how I can fix this? I never start thinking about Christmas until after Thanksgiving, it's a rule that I have always had, but this year has been an odd year. I've actually been thinking about it for months. I already know what I want to cook, where I want to put my tree, and I started making ornaments for my tree in August. For some reason I am really looking forward to Christmas this year. Maybe Santa has something extra special in store for me this year? Anyways, when I ran across this ornament exchange at Lisa's Chaos I just knew I had to participate. Anyone else want to join me? You have until October 31st to sign up if you do so hop on over to Lisa's Chaos and sign up! Maybe you will get to be my swap partner! Wouldn't that be cool? We have been trying to implement a family movie night at our house, but it just keeps getting put on the back burner. Friday night we were suppose to go to the Halloween parade in town but the rain kept us at home. The kids were really looking forward to something "fun" (you know we never have ANY fun) to do. So we decided this would be the perfect night for our first family movie night. I made homemade pizza dough in my breadmaker using this recipe, and I used a jar of my homemade pizza sauce (the recipe is here) that I had canned (it was actually my last jar so I am going to have to make some more soon). We all like different toppings on our pizzas so I divided my pizza dough into six individual sized pizzas. I set up the toppings into small bowls, and had the kids come two at a time to top (I keep wanting to say decorate) their own pizzas. Normally I am all for made from scratch meals. It's my way of showing my family just how much I care, but then there are those times when you need those meals that are really easy to prepare. These Super Easy Crockpot Meatball Hoagies are perfect for a day when you need a break, or when you can find both frozen meatballs and spaghetti sauce on sale. Who doesn't like a sale? Right? 1. Mix frozen meatballs and spaghetti sauce in slow cooker. 2. Cook on low heat for about 2 to 4 hours. 3. Place meatballs and sauce on hoagie buns. Cover with shredded Mozzarella cheese. Last night's we had Sensational Peppermint Pattie Brownies for dessert and they were a huge hit. I found the recipe on the Hershey's kitchen website, and highly recommend it. You can find the recipe here. I would love to know what you think if you give the recipe a try! You may have noticed I have been pretty quiet this week. It's been a long week for us. After homeschooling for several years my kids have made the move back into a traditional school. The transition, while smooth, has really upset our schedule, and has left us scrambling to work out a new one.